I really like New Cid Cosmetics, not least because their functional packaging is ideal for girls on the go like myself. ﻿I've been impressed with the quality of the makeup I've tried to date and so was excited to hear about i-Blush, a Light Up Blusher and Highlighter Compact, £24. Whilst I like the functionality of the packaging, with clever details such as lights and even some of their smallest products featuring mirrors, I do find that the white plastic feels cheap. To me, it's a real shame because it detracts from the quality of the products themselves. 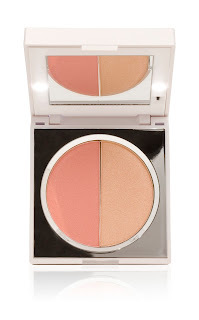 i-Blush features a split pan with one side containing a very wearable peachy, golden pink blush and the other the golden highlighter. I really liked the colours and found that I was easily able to create a natural, glowing complexion, despite being powder based as opposed to my prefered cream formulas. In fact, the only difficulty I had was containing the mess- I found there was a lot of "drop" with these powders. Have you tried New Cid i-Blush as yet? What did you think?